“Recording engineer and restoration producer Mark Obert-Thorn extends his survey of the Robert Kajanus (1856-1933) in the recorded legacy of Jean Sibelius with this fine assemblage of recordings, 1930 and 1932. 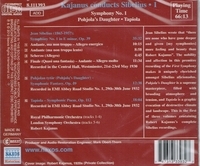 In 1930, English Columbia contracted with the Finnish government to disseminate Finnish music via the works of Jean Sibelius, especially as led by a native-born interpreter of the first rank in the recorded début of the Sibelius symphonies. Robert Kajanus had the approval of the composer, who remarked that of the ‘many men who have conducted [my] symphonies during the last thirty years. . .there are none who have gone deeper and given them more feeling and beauty than Robert Kajanus’.